Harriet Tubman was an escaped slave who led over 300 slaves to freedom between 1850 and 1860. 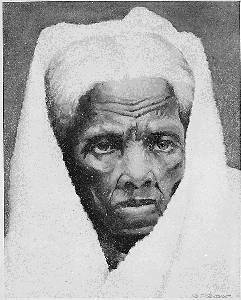 Harriet Tubman was born around 1820 on a plantation in Maryland. Like many slaves, Tubman was often hired out to work for families that lived near her owner. But unlike many slaves, she was allowed to return to her family between jobs. Nat Turner's Rebellion in 1831 spread the ideas of escape throughout the slave community, and Tubman began to dream of freedom. As a child, she aided a runaway slave by blocking the path of the overseer pursuing him. The overseer struck her in the head with a two-pound weight, and Tubman experienced sudden blackouts for the rest of her life as a result. It wasn't until 1849 that her dream of freedom became a reality. She was then married to John Tubman, a free man who did not support her desire to escape slavery. Tubman left him, and with the help of the Underground Railroad made it to Philadelphia. In less than a year, she returned to Maryland to lead her relatives to freedom. But Tubman did not stop there. Over the next decade, she would lead over 300 slaves to freedom along the Underground Railroad. When the Fugitive Slave Law passed in 1850, Tubman decided to lead her charges all the way to Canada, since they would immediately be free. In 1857, Tubman moved to Auburn, New York where she became involved with reformers and abolitionists like Susan B. Anthony and Ralph Waldo Emerson. Tubman also became involved with John Brown, helping him to plan his raid on the arsenal at Harper's Ferry. During the Civil War, Tubman worked as a Union nurse and spy. After the war, she continued to work for women's rights and the rights of African-Americans. She died in 1913, a resident of the John Brown Home for Aged and Indigent Colored People, which she had founded in 1908.